here's a woods clover/chicory plot with a couple rows of turnips down the middle. 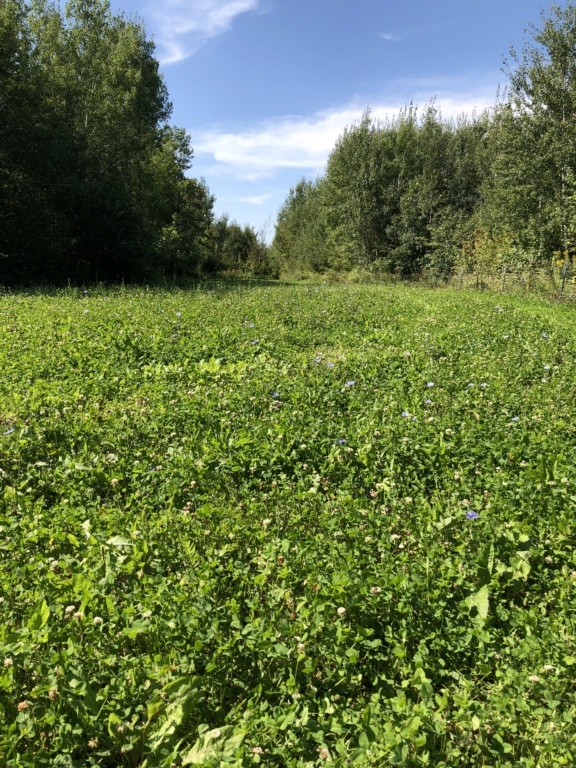 We use to sell "Whitetail Institute's - Imperial Whitetail Fusion" seed, it combines Imperial Clover with WINA Chicory to deliver exceptional benefits for deer, especially in areas subject to summer drought. Clover delivers antler-building protein, while WINA Chicory fills the gaps if extended heat slows clover growth. This combination makes the perennial crop extremely cold tolerant and resistant to drought, heat and disease. Seeds are coated with RainBond™ to enhance survivability. It's lasts up to five years from a single planting, good product combination. Buck, this is exactly what I planted here with the addition of some "wintergreens" planted down the middle. Grouse, rabbits, deer, bear, they all love it. Funny though, I just like attracting the wildlife. I don't even hunt by this plot. My hunting turf is about 1 1/2 hours west of here. Better deer country. Paul that is a good product, we sold ton's of it yearly to the locals in northern Colorado and southern Wyoming.